RIBAdoMAR Caión (Apt. 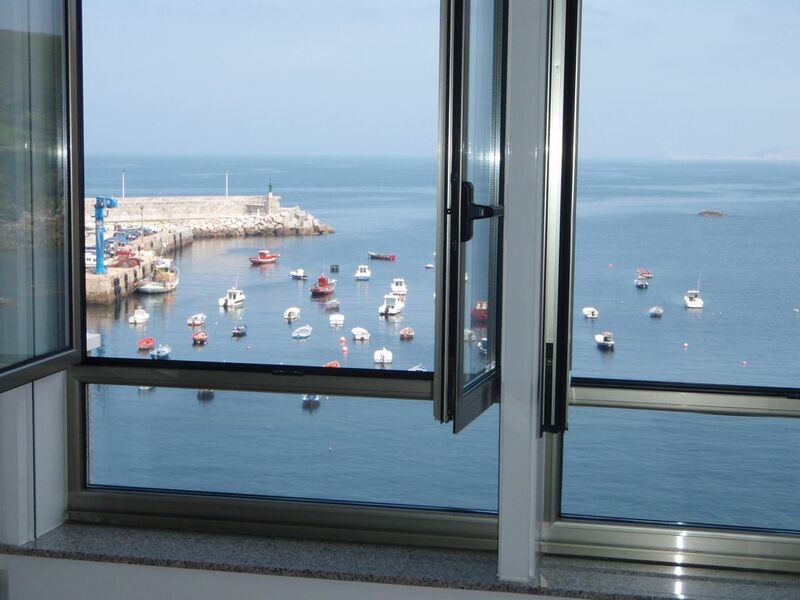 2º), 2 bedrooms, 2 bathrooms, incredible sea views. In the center of the town, in the Plaza Eduardo Vila Fano, you can rent one of the three apartments with magnificent views towards the fishing port, a few meters from the beach and the promenade. Very sunny, large windows with direct views of the sea, being a few meters in front of the sea, you can hear the relaxing sound of the waves, ideal to relax and unwind. They have everything you need to spend a pleasant vacation, are fully equipped with bedding and bathrooms, kitchenware, appliances and heating. The main room has a 1.35m bed and the other is a 1.20m bed. Additional bed of 0.90m can be placed with the availability of a cot, high chair and bathtub. Sehr schöne Wohnung mit beeindruckendem Ausblick. Die Wohnung ist modern eingerichtet und hat sogar eine Waschmaschine. Der Ausblick und die Lage sind einzigartig. Wenn man kein Spanisch spricht ist die Verständigung etwas holprig aber trotzdem SEHR herzlich und nett. Alojamiento perfecto situado en pleno centro, la anfitriona Isabel muy atenta y el piso perfecto. Nos hemos sentido como si estuviéramos en casa y que decir del entorno, perfecto para pasar unas vacaciones relajadas. Estancia agradable en un apartamento super limpio, que es lo que más valoro. Es sencillo pero agradable, con muy buena ubicación y las vistas lo mejor de lo mejor, es un lujo dormirse con el sonido de las olas. El tiempo bien, podía ser mejor porque hubo varios días nublados, pero la temperatura buena. Totalmente recomendable el apartamento y el pueblo, que es pequeño pero tiene lo imprescindible para no tener que salir de él ni coger coche, estupendas terrazas para ver la puesta del sol, playa limpia y no muy concurrida, puerto bonito, las gentes muy agradables, algo ruidosas eso sí, pero buena gente. Volveremos sin dudarlo.